Yesterday I noticed the trees outside my house had started to turn colors, and I got so happy. I know I've already said this a million times, but I really missed fall when I was in L.A. It's such an inspiring season in so many ways, and I always see that influence in my cooking. The hubs and I have been eating lots of soups and stews lately, and I'm bring out the nutmeg and cinnamon a lot more when I bake. So, naturally, I wanted to find a cozy, spice-inspired recipe for this week, and the recipe box I thrifted this past weekend gave me plenty of options. I finally settled on cupcakes...cranberry cupcakes. 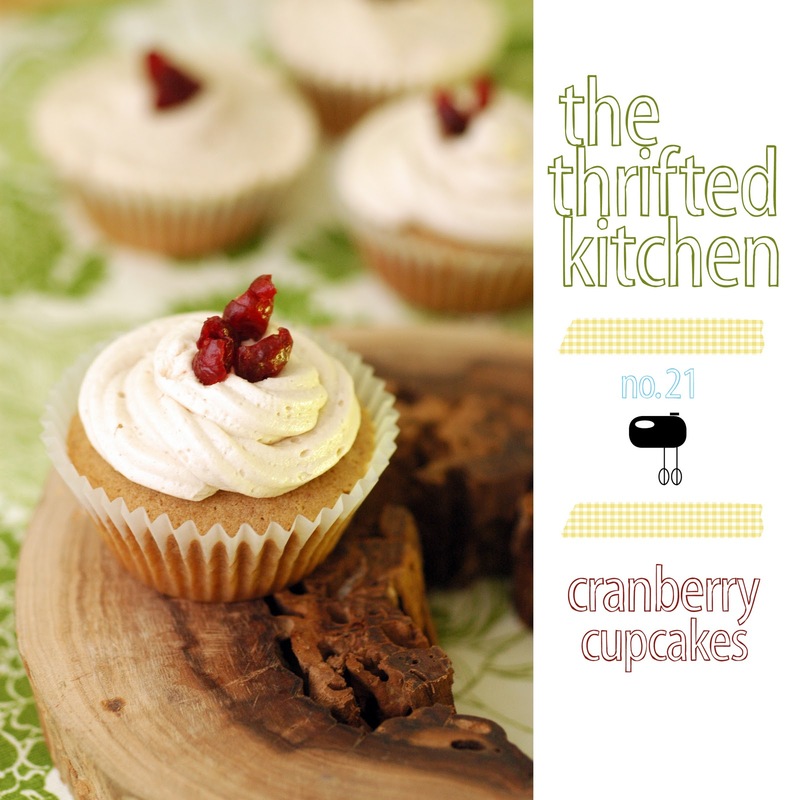 And a couple cards past this recipe I found one for buttercream frosting, which I enhanced a bit with some cinnamon. The one ingredient that was new to me (as in I've never used it) was the jellied cranberry sauce. I was a little wary because it looks so...jellied. And I've never really eaten it before, either (cranberry sauce has never been a big deal for Thanksgiving in my family). But it mixed right into the batter, along with sour cream, which told me these cupcakes would turn out moist and fluffy (which they did). 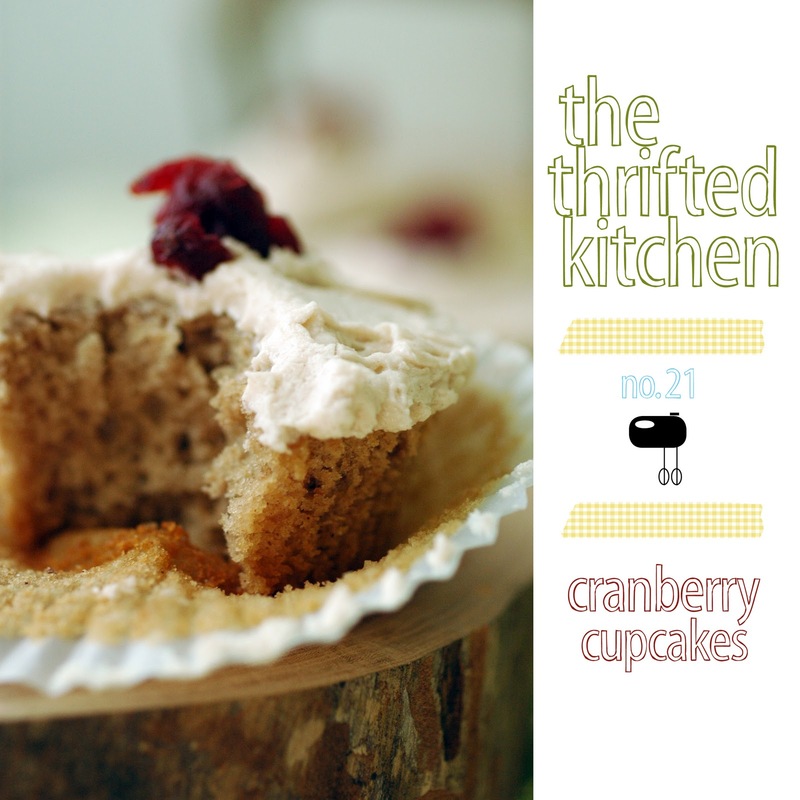 In the end, the batter didn't have a ton of cranberry flavor due to all the cinnamon and nutmeg, so I had some dried cranberries in the pantry that I garnished each cake with, but you can also use what's left of your jellied cranberry sauce, if you dare. :) Or I suppose you could put dried cranberries into the batter instead of the walnuts. Whichever you do it, they're a great transition in this beautiful new season! * If you want just plain vanilla frosting, omit cinnamon and add another teaspoon of vanilla. Cream shortening and sugar together until light. Add eggs and beat well. Sift dry ingredients together; add to cream mixture alternately with sour cream and cranberry sauce. Stir in nuts. Place paper bake cups in muffin pans and fill 3/4 full. Bake in moderate oven (350 degrees) for 25 minutes. Cream butter until very soft and smooth. Add sugar gradually, creaming thoroughly. Add salt, vanilla and cinnamon (if using). Gradually whisk in the cream (or milk), using just enough to produce a smooth, spreading consistency. Spread onto cupcakes with knife or, if you have a piping kit, place into bag, attach nozzle and pipe on cupcakes. 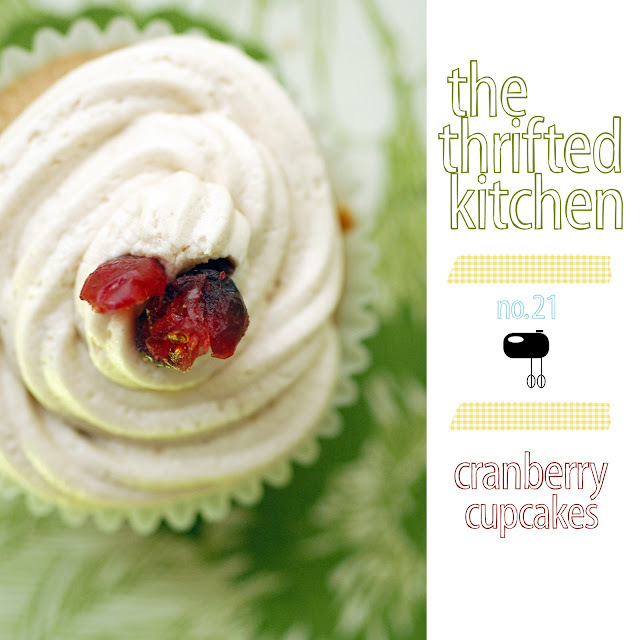 Garnish with dried cranberries (or jellied cranberry pieces).